Disney and Marvel are releasing this in the States next week, and even though we're being made to wait almost *a month* it's never to early to find out how good the film is. Ant-Man and the Wasp moves so fast it feels like it’s over before it begins. Set over the course of about two days in the Marvel Cinematic Universe, it’s one of the most propulsive Marvel films to date. Director Peyton Reed’s movie is also exciting, beautiful, funny, and heartfelt to boot. When we last left Scott Lang, a.k.a. Ant-Man (Paul Rudd), he had been captured and jailed for helping Captain America during Civil War. Two years have passed since then, and now Scott is just about done with his FBI-mandated house arrest. His relationships with his daughter Cassie (Abby Ryder Fortson) and ex-wife (Judy Greer) have improved, and he hasn’t been in touch with Hank Pym (Michael Douglas) or Hope Van Dyne (Evangeline Lilly) in a long time. That, of course, is about to change. Hannah John-Kamen plays Ghost, a very interesting MCU villain. After establishing where everyone is in the MCU, Reed puts most of that aside and focuses on this story: Lang’s last days under house arrest and the circumstances that force him to contemplate breaking out, which will risk extending his sentence. Obviously, those circumstances have to do with Hank and Hope, who need Scott’s help for a very important mission regarding their long-missing family member, Janet Van Dyne (Michelle Pfeiffer). So, on top of that whole superhero thing, there’s the perpetual threat Scott could get caught by the authorities. 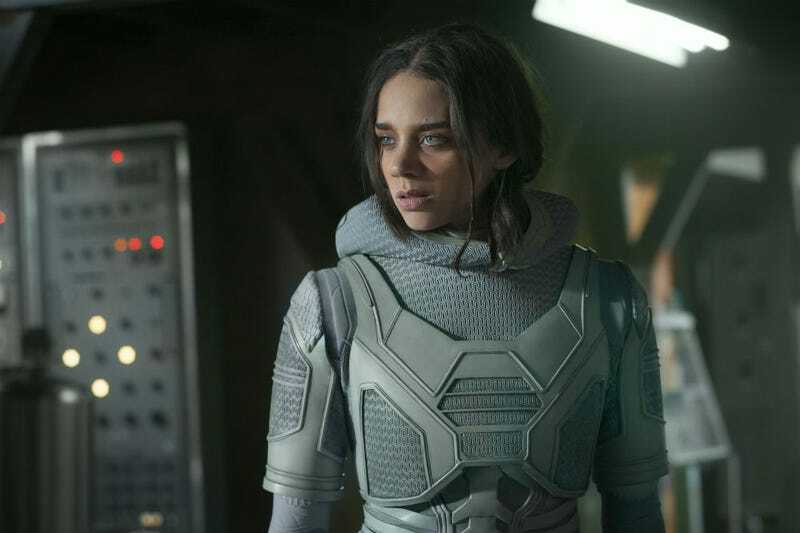 Those threads then get cranked up when a mysterious character nicknamed Ghost (Hannah John-Kamen) appears, with her eye on hijacking Hank and Hope’s plan for her own agenda. When all those things get scrambled together, Ant-Man and the Wasp is delightfully nerve-wracking, but that’s just the start of it. This is an Ant-Man movie so in addition to that tension, there’s humor, thanks in large part to Michael Peña’s Luis as well as some wonderful comedy set pieces. There are great father-daughter dynamics, both with Hank and Hope, as well as Scott and Cassie. There are many, many innovative uses of Pym’s shrinking technology, not just in the form of Ant-Man and the Wasp, but with buildings, cars, toys, you name it. Then there’s the juxtaposition of the beautiful San Francisco settings with trips to the tiny, trippy Quantum Realm along with the insanely awesome effects for the Ghost character. Reed and his team really tried to up the action and visuals this time around, and it shows. 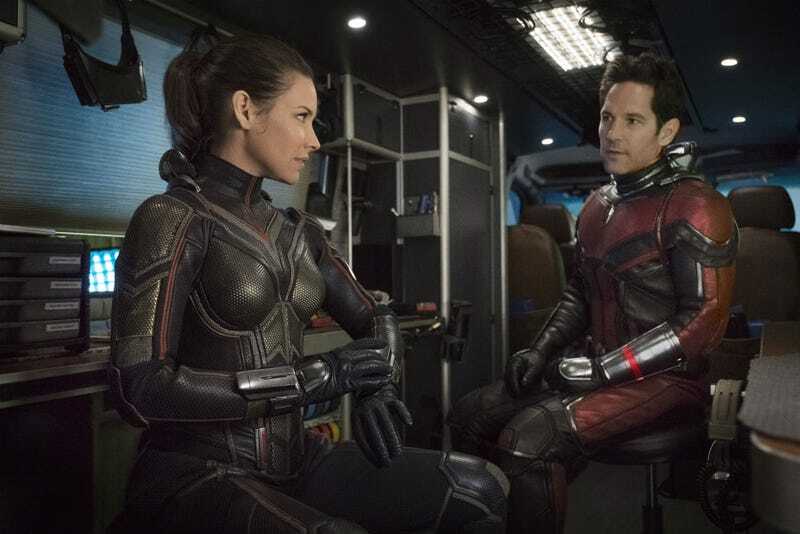 It also helps that Ant-Man and the Wasp spends so much time with Evangeline Lilly as the Wasp and Michael Douglas’ Hank Pym. They’re such great characters, with dynamic backstories and motivations, that they easily overshadow Scott Lang for most of the film, which isn’t a bad thing. And while Douglas may be the legend, delivering one of his more dynamic performances in ages, every time Lilly is on screen, she steals the movie. The actress exudes a badass confidence and energy that basically makes Ant-Man and the Wasp feel like it should have been called The Wasp, Featuring Ant-Man. It doesn’t hurt that she gets most of the best action scenes, too. All the while, these pieces are each working within Reed’s compressed, pressure-cooker timeline, which has its pluses and minuses. On the plus side, because the movie is moving so quickly, not only is there that ever-present tension, but questions about the MCU or Infinity War are rendered almost insignificant. The story is simply too goal-orientated and jam-packed for most of that to matter, and it works to the film’s advantage. On the other hand, the constant momentum of the movie means internal character development is mostly pushed aside. The characters are basically the same people at the beginning of the film as they are at the end. Ultimately, that doesn’t hamstring the movie all that much, but it makes it feel a bit superfluous in overall the scheme of things. 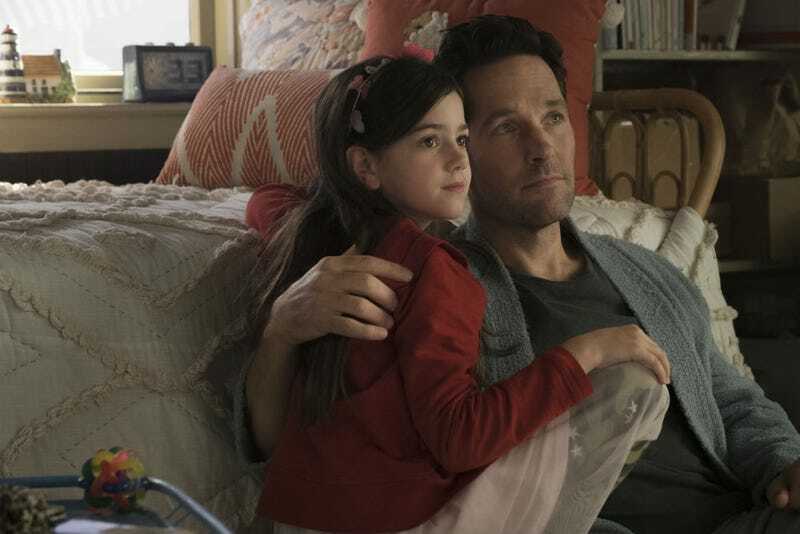 There’s great family stuff in Ant-Man and the Wasp. But, that’s kind of the point here, right? Coming off a movie like Avengers: Infinity War with apocalyptic stakes for the world, it feels right to scale everything back and tell a concise, character-driven story. It ups the ante from the first Ant-Man, but also opens up the world of these characters in fascinating and intriguing ways. Ant-Man and the Wasp is a crowd-pleaser of a film, and a reminder that great characters and fun scripts are what make enjoyable comic book movies — not just a huge shared universe.